Updated Saturday July 9, 2016 by AUBL Miami. Kendall Hyundai presents AUBL Miami Semi-Pro Baseball special event broadcast game of the week this Sunday 7/10/16 at 6:00 pm at Flamingo Park in South Beach! This game is a playoff rematch from last season. 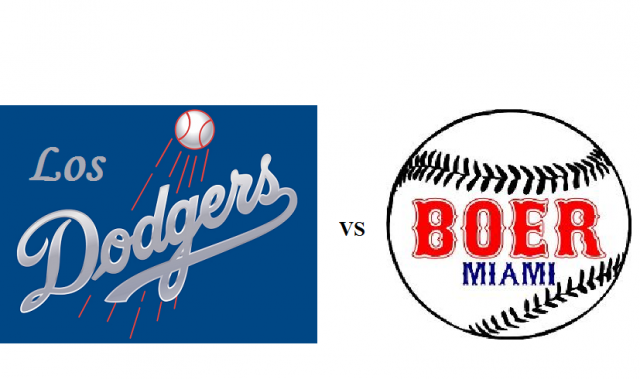 Boer Miami always features a very strong pitching staff with Daniel Chaffardet as the ace. Boer's batting lineup is one of the toughest in AUBL Miami, with homerun power throughout the lineup. Los Dodgers have a balanced team and can beat anyone in the league with their gritty, hard-nosed style. Catcher Nick Geary is a former AUBL Miami MVP runner-up.